Can any small town in the world fathom receiving one million visitors in 40 days? 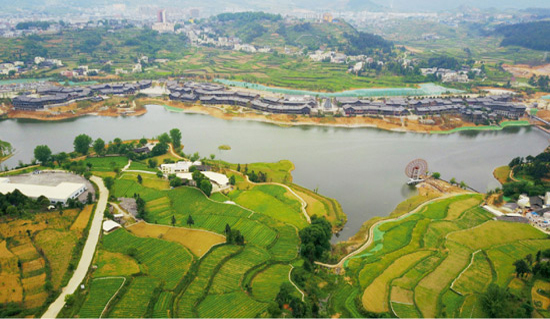 It is not a dream but a reality for Danzhai Wanda Village in China. Danzhai is located in Guizhou province in southwestern China, and is considered one of the 592 poorest counties nationwide. Its lucky break came in 2014 when Wang Jianlin, Chairman of the Wanda Group, donated RMB 1.5 billion (approximately $US 225 million) to help revitalize Danzhai’s economy. 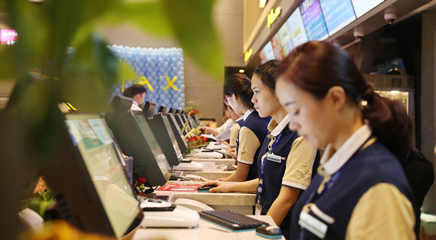 Wang is one of the richest men in China with numerous real estate properties and movie cinemas. The donation package included a new tourism town, a vocational school, and a Poverty Alleviation Fund. The construction went in full swing and the new town was built and opened in July of 2017. 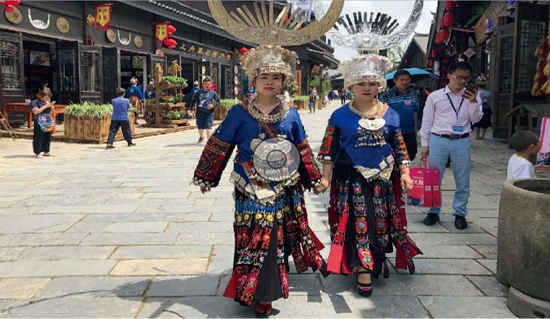 Situated on 2,400 acres land and covered roughly 538,200 square feet, the Miao and Dong minority-culture-themed town won the 54th Gold Nugget Awards - Best International Commercial and Special Use Project Awards this past June. The area is also home to the largest water wheel according to Guinness World Records. Over one million tourists visited the town in the first 40 days. The economic impact? More than RMB346 million (equivalent to US$52 million) was generated, accounting for 57.1% of the entire county’s tourism industry revenue for the first six months of 2017. Located by East Lake with an average annual temperature of 59°F, the town’s one-mile long street houses 12 hotels including the Wanda Hotel, a Wanda cinema, 210 retailers with 339 storefronts, four town-squares showcasing indigenous cultures, and three arenas designated for bull-fights, rooster-fights and bird-fights (efforts to preserve the native traditions). 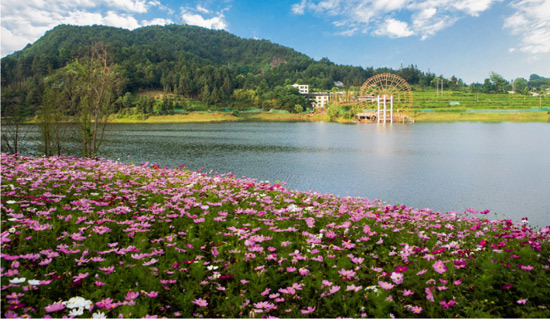 Nearby the lakeside are also the 600-acre flower terraces. With public transit, bars and restaurants, and gift shops full of souvenirs, it is a full-service destination. The town showcases an unbelievable collection of the Intangible Culture Heritages (ICHs). These are cultural assets, being strictly certified by the national or provincial governments. Danzhai gathers 24 of them including the most valuable ones like the papermaking techniques invented 2,000 years ago. I once spent a half day on the road to search for just one ICH – a silver jewelry master and his techniques. I surely wish there was a place like Danzhai to gather so many of them! 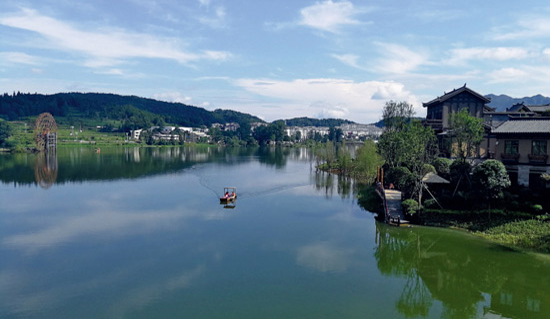 Some countrymen perceive the town being “too artificial”, unlike the 2000-3,000 years old natural towns in China. However, Wangda Group’s intention was to alleviate poverty through tourism development. Now the new town is full of local service providers and is rapidly approaching the projected 3,000 jobs. Wang Jianlin, with his assertive military background, may never be bothered by the “artificial nature”. He focuses on the purpose. The unconventional project is conducted by unconventional minds and people. Shang Rui-Fei is General Manager of Danzhai Wanda Village Business Development Co., Ltd. Fitting the typical “Wanda project HR profile” (male, 30 to 40 some, on the go 24/7), Shang is extremely busy and has not seen his family 500 miles away for six months. He’s visited every village in the county to scout out talents and traditions. His team has perfected every store’s exterior to maintain cohesive characteristics of the town. One of Shang’s prime examples is a talented young minority woman, Zhang Yi-Ping, who was extremely poor and lacked opportunity. Shang convinced a silversmith to offer her a store corner. Zhang now holds impressive credential certificates as she coaches others and sells products. I cannot refuse an exquisite batik silk scarf: a pair of white peacocks on an azure blue background. The 50-hour labor piece is priced at only $50. Zhang represents many locals who now have big hopes. The non-residential town completely relies on visitors to sustain. The management integrates a small-town charm with big-city convenience, and introduces modern commerce practices to locals who live a primitive lifestyle. The marketing message says, “When you come to eat, play and sleep, you help 20 industry sectors in Danzhai! Do your part!” Brochures with itineraries are distributed to guide visitors to expand deeply into the county: to waterfalls, rice terraces, and the largest mercury mine in Asia. One-hundred and thirty tour operators nationwide have been contracted to bring groups to Danzhai. The town is also technologically equipped: free and fully covered Wi-Fi, cashless transactions via Ali-Pay, shared bikes, etc. Early morning on the Wanda hotel balcony, I thoroughly enjoy the fresh air, enchanted birds, and the lush rolling hills. This charming town undoubtedly offers unique experiences to visitors while strongly helping the local economy. It is preparing for the second phase: building a children’s park, RV site, and even a farm. What I see today is just a nice prologue of the Danzhai-Wanda story.